Last week I got 'together' with Alison Bomber from Words and Pictures and Brenda Brown from Bumblebees and Butterflies. Well it was a virtual meet up over Skype! You may recall Brenda and I did this last year to create our 'Skype Journals'. This time it was lovely that Alison joined us too, we had a great few hours crafting together with lots of laughter along the way. We had decided we were going to work on a large mdf surface in advance but the rest of the session was decided as we went along - each of us selecting a step in the process. Brenda was very organised and documented our steps!! Some of these steps took alot longer than others. It was fun listening to each others thought processes without actually telling the others what we were doing - that had to wait for the BIG REVEAL at the end. N - Use some texture paste any way you wish. A - Dilute one colour of paint and apply in any way you choose. B - Add crackle in anyway you want. N - Add texture to one or more of the embellishments. A - Add colour to one or more of your embellishments. B - Create a panel to use in building layers. N - Apply a coat of paint to the background any way you like. 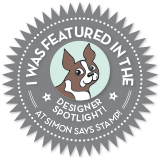 A - Stamp ...... Alison said 'it's in your hands' but it must be pure stamping over the background. B - Dip, drip and dry watery washes. N - Edge the base in whatever way you want. A - Trial the composition and design and finalise the embellishments. B - Do an Alison and add some words. N - Add a touch of metallic. 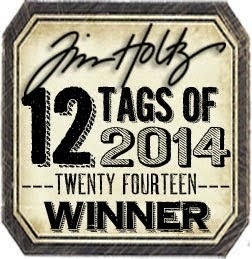 Alison and I both worked on a large MDF tag - Tim Holtz Etcetera or That's Crafty - GiganTAG. This is a large surface - around 15 x 7.5 inches - a little scary when it comes to composition! I kept my embellishments smallish but then struggled with all the empty space - I don't do empty space very well. I confess I added the square / rectangles onto the mesh after we finished as it just seemed too empty! 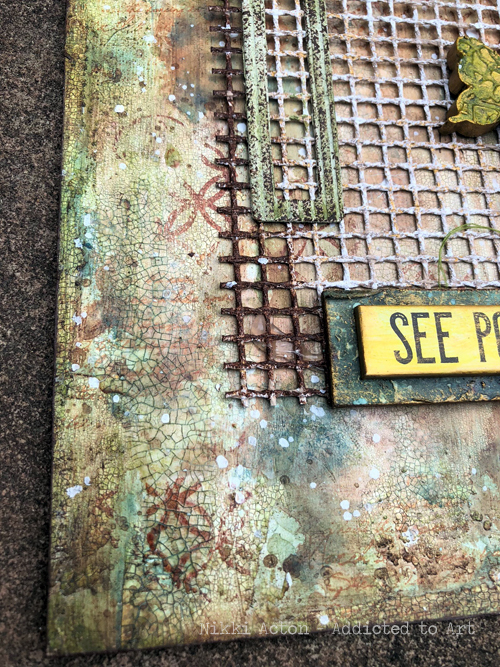 The background had quite a few layers of texture, crackle, paint and stamping! 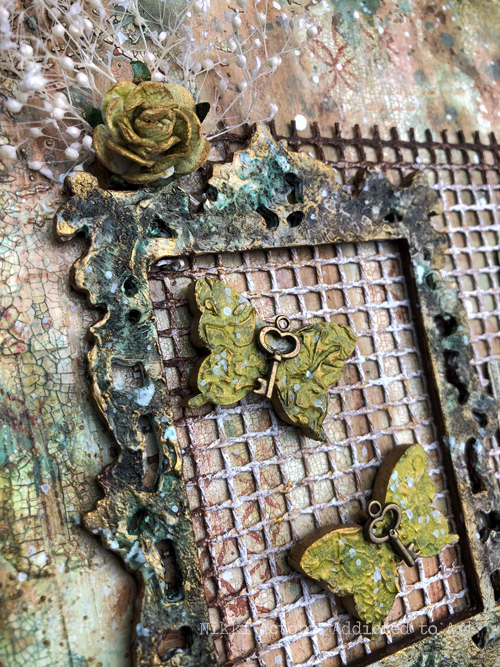 I think the Tim Holtz Ornate frame is my favourite part of this project. I layered a few up and gave a thick stippled coat of gesso before adding PaperArtsy Infusions and a bit of water. I blasted it dry and stippled some matt medium over it to help seal the Infusions before adding touches of gold paint. Brenda's step of adding a panel resulted in me grabbing this old mesh I have and adding some paints! 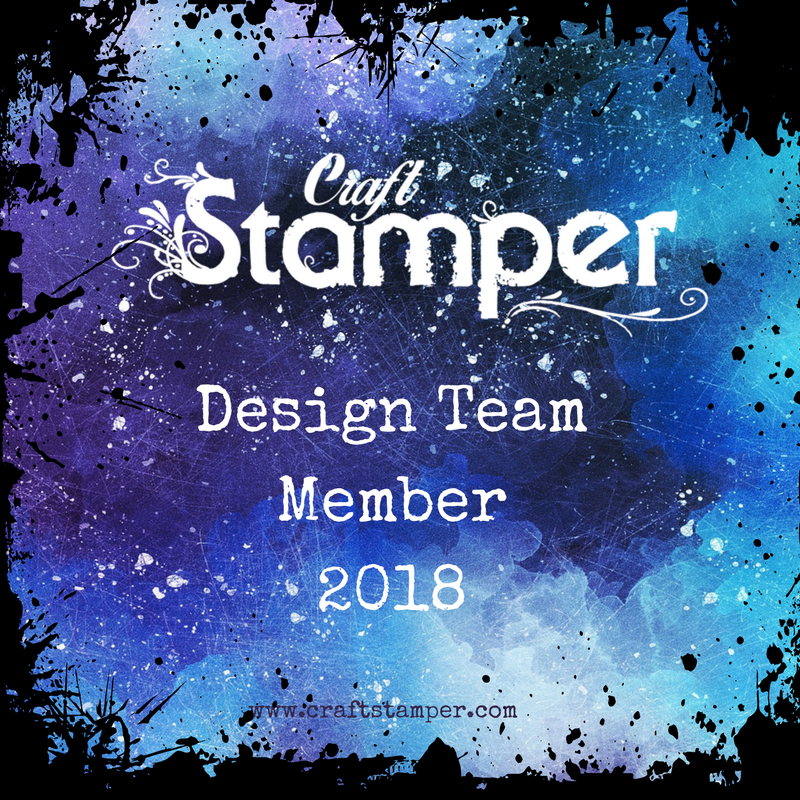 Once we were all done it was time for the big reveal - so if you havent already do head over to Alison and Brenda's blogs to see their amazing designs. Thanks to both Brenda and Alison for a fun day! We are all a little short of crafting time these days so it was wonderful to take this time out. 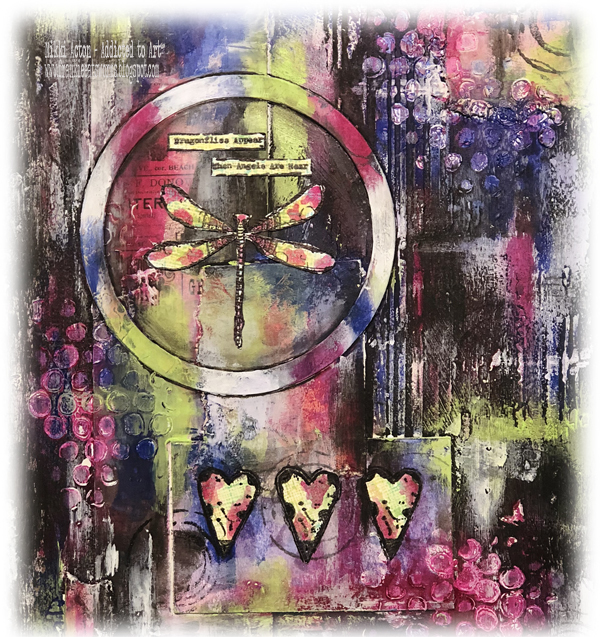 I would like to join in the latest challenge at Frilly and Funkie - Creatures Great and Small and Anything Goes at Stamps and Stencils. Wow, love this one too! That mesh is a great touch. Just been reading Alison and Brenda's versions. Looks like a great day and huge fun all round. The background texture is absolutely stunning - the stencilled crackle, with all those layers of colour and hints of gold to catch the light - amazing. 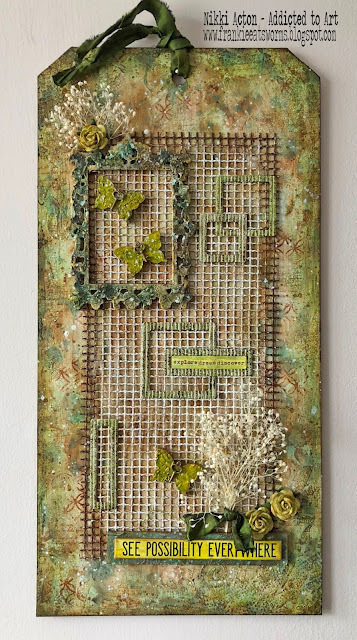 I love your mesh too - what a clever way to add a panel without losing all that hard work in the background! 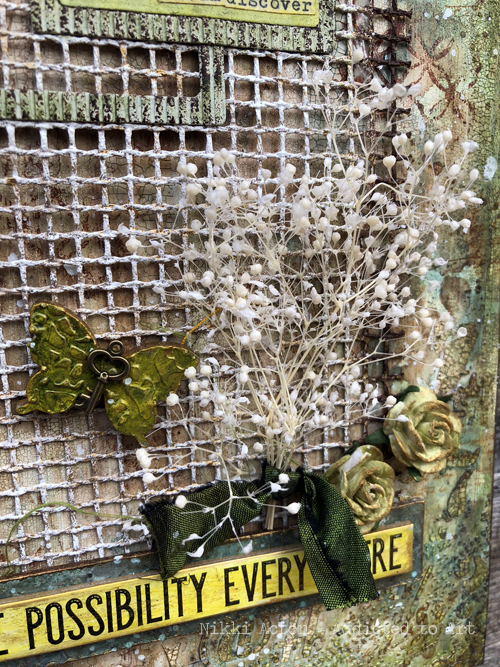 The dried flowers are a lovely touch - and I think your square frames are perfect to fill the space. Meant to say... so nice to see it properly - the Skype screen really didn't do the details justice! I love the colours and do enjoy the crackle, it really adds a lovely effect. Those frames finished it off nicely. I know about empty spaces too, sometimes it just needs a little something. :) Great work to all of you ladies. Sounds as if the three of you had great fun with super results! Your one looks super! It is amazing how every one of you produce your own unique pieces from the same processes. 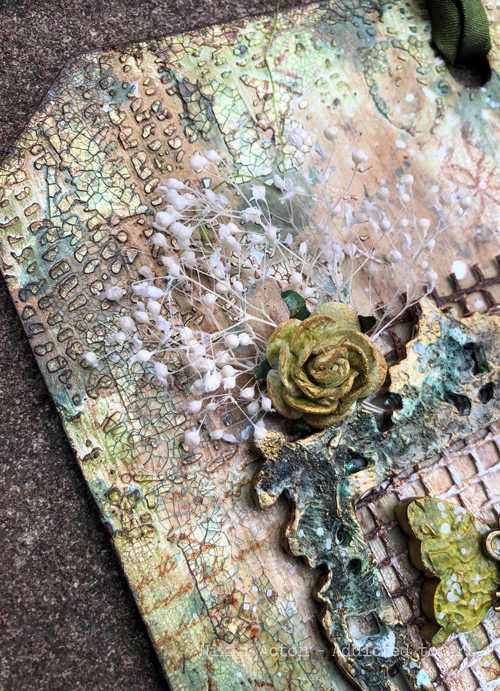 The greens and brown stamping look so gorgeous with all that crackle and texture paste. lovely project and looked like a lovely day too. How fun you girls got together on Skype and challenged each other this way. I haven't seen what Alison or Brenda made yet, but this is FABULOUS! I love those rich colors and oh, that texture! I'm delighted to see you playing along at Frilly and Funkie! My apologies for commenting late, but we are still trying to get things straight after the hurricane here. Big hugs! What a fun idea! And the results is gorgeous! There is so much wonderful texture here! I love how balanced and beautifully composed this is! Thanks so much for sharing with us at the Frilly and Funkie "All Creatures Great and Small" Challenge Blog! Happy crafting! Fabulous ! Nikki . The background is lush with all the texture, crackle and gorgeous tones of colour and your ornate frame is indeed stunning ! Fabulous! It did look to be such a fun time you had! I think it is interesting to see how different your projects turned out!